Congratulations on your acceptance to UC Davis and welcome to UHP! 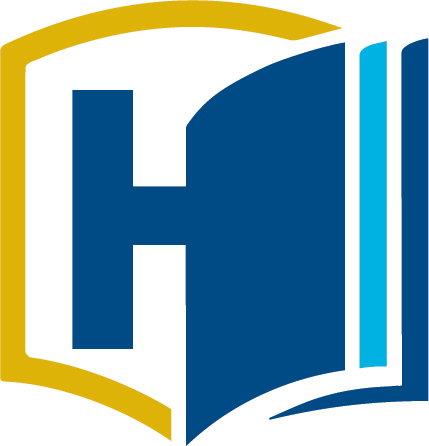 This page serves as the information hub for new first-year students participating in the University Honors Program. Please check this page regularly as it will be updated throughout the Spring and Summer until classes begin in Fall. If you have any questions about your participation in the University Honors Program, please email us at uhp@ucdavis.edu. 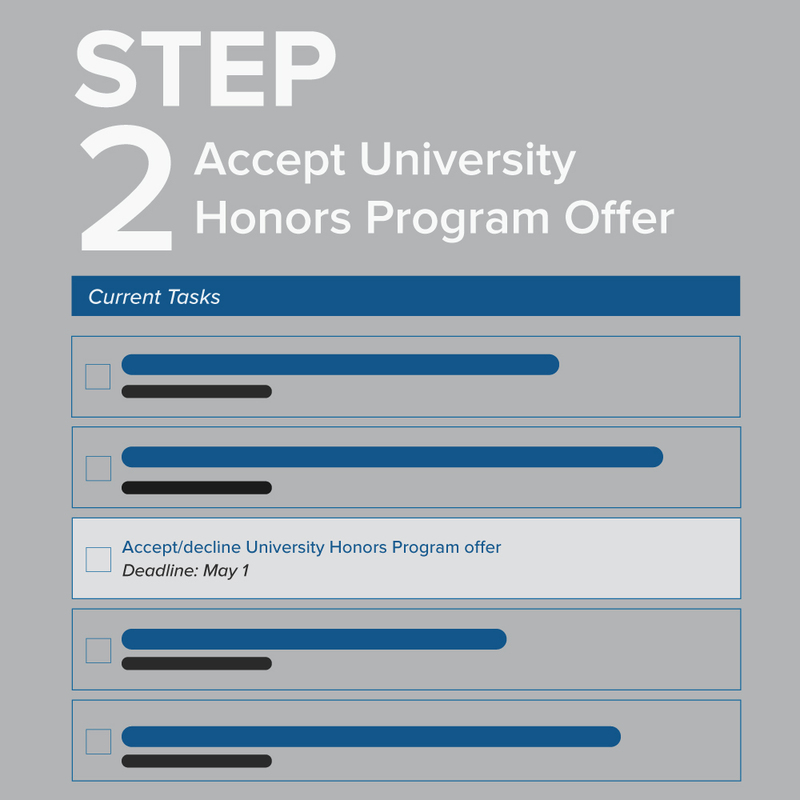 If you haven't already done so, be sure to accept your invitation to UHP inside of MyAdmissions by the May 1st SIR Deadline - if you do not complete these steps you are not yet in UHP! 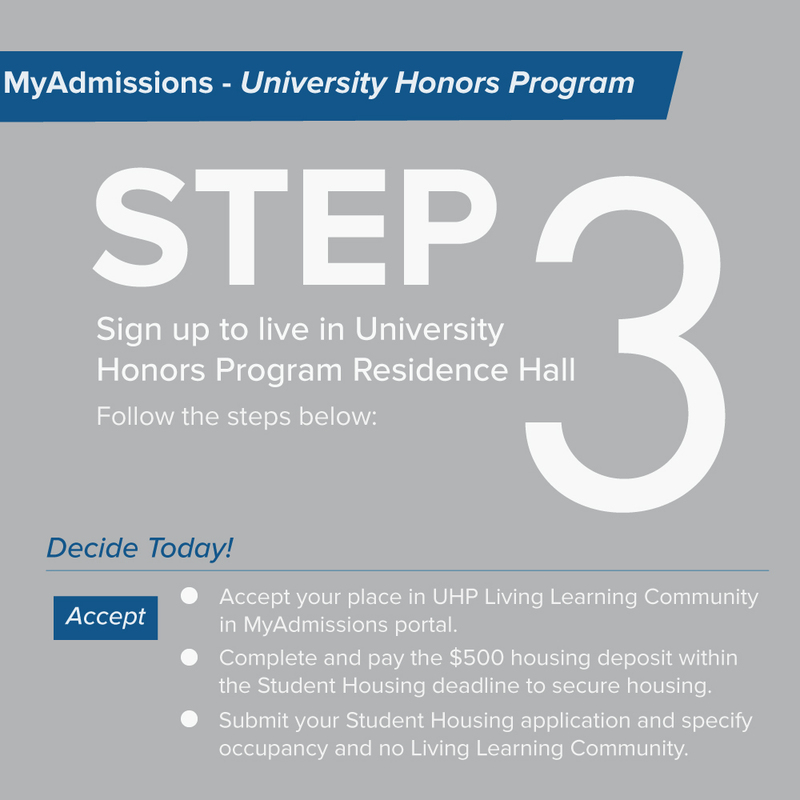 Have you been offered first-year admission to UHP?Be sure to follow the steps below! During the first-year, honors students live in the Honors Living-Learning Community (LLC). Located in the Tercero residence halls on campus, the Honors community gives students a place to develop friendships and work collaboratively outside the classroom environment. Students live among a group of similarly high-achieving and motivated peers who are registered in related courses, allowing for a strong social foundation that many students keep throughout their college years and beyond. In addition to building a close-knit community, the honors living experience provides a fun, intellectual, and supportive environment, while encouraging active leadership and campus involvement. Honors residents can participate in an abundance of social events, workshops, mixers with professors, and even some Honors Courses! Is living in Currant Hall, the honors Living-Learning Community (LLC), really required? Yes, we require that all incoming Honors students live in Currant Hall, the UHP living-learning community, as it is one of the central elements of the Honors experience. Living in Currant Hall with your Honors peers during your first year provides you a great foundation of community at Davis during your transition to the university. Living in Currant Hall does not mean that you will be isolated from the rest of campus; most Honors students are very involved in the many organizations, sports, and communities at Davis. Students may opt out of this scenario for religious reasons, living at home, or living in another LLC. Incoming first-year students should contact uhp@ucdavis.edu if that is the case. Can I have a roommate who is not in UHP live with me in Currant? Unfortunately, the space in Currant Hall is limited and priority goes to incoming Honors students. Under rare circumstances students not in UHP may live in Currant but we are not able to guarantee any such roommate accommodations. For inquiries contact us at uhp@ucdavis.edu. Students who have completed the second module are welcome to explore the First Quarter Course Recommendation Tool, which generates a list of recommended first-quarter courses based on major, AP scores, IB scores, and placement exams. In addition to completing Pre-Orientation, it is expected that all new first-year students attend Orientation. This program is a two-day, one-night event that is full of sessions and activities. Orientation dates are below, and dates with asterisks (**) correspond with the UHP Honors Welcome for each College. Click on each college to view its orientation dates. We hope that you will join us for Honors Welcome this summer, a half-day event hosted by UHP the day before or after an Orientation session, one for each college. At Honors Welcome we will discuss the UHP curriculum, introduce you to your Honors peers, and have current students, faculty, and staff available to answer any other questions you might have. Please see our FAQs below for more information about Honors Welcome and Summer Orientation. What is the difference between Orientation and Honors Welcome? Do I have to go to both? Honors Welcome is a half-day event hosted by UHP the day before or after an Orientation session, one for each college. At Honors Welcome we will discuss the UHP curriculum, introduce you to your Honors peers, and have current students, faculty, and staff available to answer any other questions you might have. It is highly recommended that you attend the Honors Welcome associated with your college to meet other peers in your college, but if you are unable to you will be able to register for another college’s Honors Welcome. We strongly encourage you to attend Honors Welcome, but if scheduling conflicts arise please contact our staff so that we can make sure you receive all of the information you will miss and so that you may register for your Honors class. Orientation is a two day event hosted by UC Davis which provides incoming students general information about campus resources, student organizations, and other important information will be discussed. Class registration occurs during Orientation, and Honors students will sign up together with the assistance of Orientation and UHP staff. You will also choose your honors class during Orientation. Please visit the Orientation page for more information. When and how do I sign of for Honors Welcome? All incoming first-year UHP students will receive an Honors Welcome online registration link in via their UC Davis email address. Now that you are an incoming student you should begin checking your UC Davis email address on a regular basis. This is where campus will begin sending all official communication, including UHP. Please review these FAQs for creating and using your UC Davis computing account. If you encounter any issues please contact IT Express. When and how do I sign up for Orientation? The deadline to register for First-Year Orientation is two weeks (14 days) before each session. 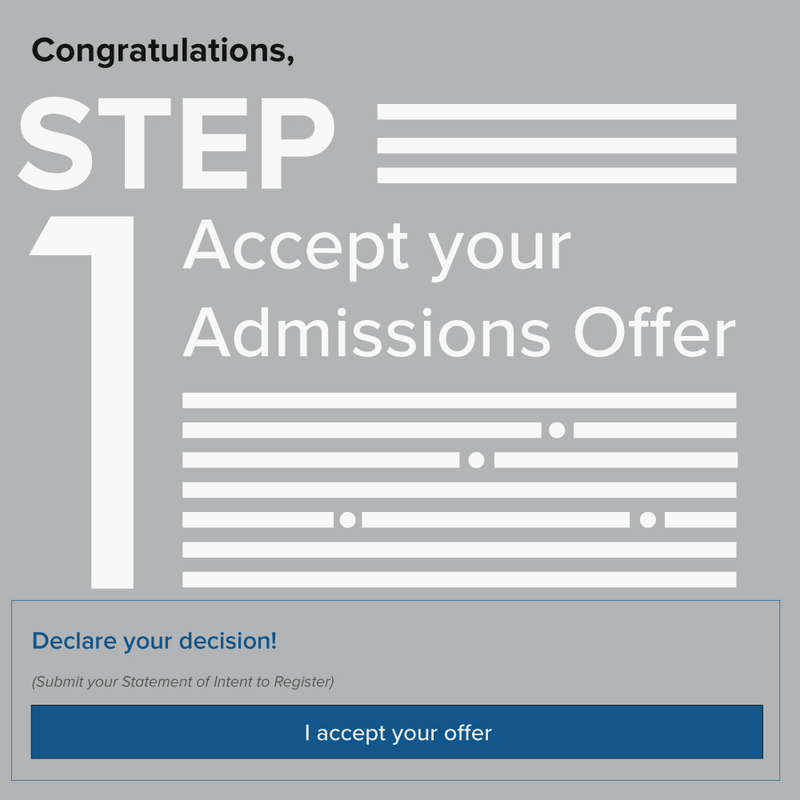 To sign up for Orientation, you will go to your MyAdmissions portal and select your session. If you are unable to attend any of your college’s orientation sessions, indicate so in MyAdmissions. Follow the Unable to Attend? instructions and Orientation staff will help you receive all the information you will need. Yes! For Honors Welcome, you will indicate how many guests you are bringing when you fill out the Honors Welcome RSVP survey. There is no charge for guests to attend Honors Welcome. For orientation you will indicate how many guests you are bringing in your MyAdmissions and pay a per-person fee. See the Orientation Registration page more information. When will I sign up for my first UC Davis classes? When will I sign up for my first UHP class? You will choose and register for your first UHP class during Orientation. If you are unable to attend Orientation, please contact our staff at uhp@ucdavis.edu so that we can help you sign up for your honors class. You will sign up for all of your UC Davis classes during Orientation as well. If you are unable to attend orientation, indicate so in MyAdmissions. Follow the Unable to Attend? instructions and Orientation staff will help you receive all the information you will need. Do I get UHP Priority Registration during Orientation? Due to the structure of Summer Orientation, students will register for classes during their Summer Orientation Session, which may not be the first day of registration. However, seats are held in all UHP courses and in popular first-year classes such that students have a fair chance of registration regardless of which orientation session they attend. Beginning in the first quarter of study, UHP students get to register on the first day of registration for all quarters they are actively enrolled in UHP. For incoming first-year UHP students, this means that Priority Registration will begin in Fall quarter for Winter quarter course registration. How do my AP/IB/community college/etc. credits fit into my units at UC Davis? For questions about credit transfer, you will want to contact your major advisor and Dean’s Office (or the Biology Academic Success Center (BASC) if you are in the College of Biological Sciences). Their advising team will be able to give you the most accurate information about how previous credits will contribute to your degree as they perform all degree checks. Feel free to visit the UC Davis Advanced Placement page to see the AP Credits Chart. Students who have completed the second module of Pre-Orientation are also welcome to explore the First Quarter Course Recommendation Tool, which generates a list of recommended first-quarter courses based on major, AP scores, IB scores, and placement exams.